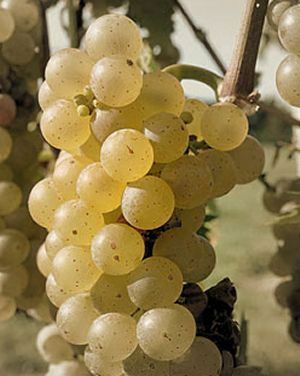 Vidal Blanc is an inter-specific hybrid variety of white wine grape , a cross of Ugni Blanc and Rayon d'Or (Seibel 4986). It manages to produce high sugar levels in cold climates while maintaining good acid levels. Vidal Blanc was developed in the 1930s by French breeder Jean Louis Vidal ; his primary goal in developing the variety was to produce vines suitable for the production of Cognac in the Charente region of France . However, due to its winter hardiness this grape variety is cultivated most extensively in Canada and in the north-eastern United States . It is somewhat resistant to powdery mildew . In Canada's, quality wine-classification system, the Vintner's Quality Alliance (VQA), it is the only hybrid entitled to the highest category of quality. This is the Designated Viticultural Area (DVA) status. However, this honor is reserved for its Ice Wine incarnation only. This is one of the most widely planted hybrids in all of Ontario. As an ice wine, Vidal has the classic Rhine wine qualities of rich honey, citrus flavors reminiscent of Grand Marnier, and hazelnuts, with an underlying metallic finish like mineral water. 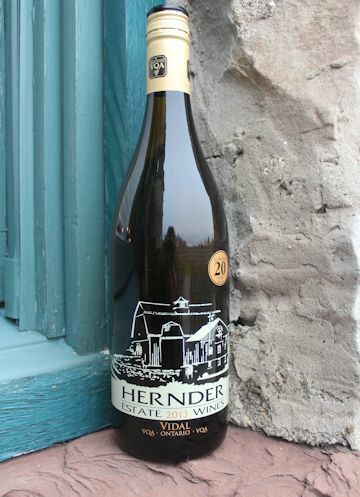 The reason these Vidal ice wines, like other ice wines, are so rare and expensive is that the grapes stay on the vines until late November or December. While hanging, the grapes shrivel like raisins, so when they are finally pressed, the grape yields little juice. But this juice is highly concentrated in flavor and sugar. These wines are great alone or with chocolate desserts.